Anti-aging is a funny thing, isn’t it? Wrinkled hands might not be something that is on your radar, but for someone else it is the biggest thing on their mind. What worries you could not even be a blip on my radar. Some women grow older and embrace their greys. Others cover them up every two weeks. What’s right? What’s wrong? I know the answer. Respecting everyone’s decision to do whatever the hell they want. At 41, I have learned this lesson. Lady and the Blog is all about finding the best information out there for anyone who wants it. I recently had a conversation about a beauty trend I had no idea was happening. Did you know that people are using injectables in their wrinkled hands in an attempt to make them look younger? They are trying to erase the fine lines and bring some plumpness back that they’ve lost throughout the years. I found that fascinating! I truly did. I’m not there yet, but I still wanted to write this post in case you were and were looking for some sort of solution. I sat down and chatted with a nurse over at Rafal Dermatology and she gave me the inside scoop on a few treatments that many of their patients are turning towards. What are most Long Island women doing these days to battle wrinkled hands? Let’s break them down – one at a time. Microneedling is not just meant for the face. You can do it on your wrinkled hands as well! In fact, Rafal Dermatology suggests it! The needles are inserted into the patient’s skin in order to stimulate the natural healing capacity of the body. Nothing unnatural is used as the process encourages the body to stimulate collagen growth on its own. To learn more about microneedling with PRP, read my full write up. A chemical peel will work the same way on your face as it will on your hands. So, the next time you book an appointment at the spa, be sure to ask to include some extra time to fit in treatment for your wrinkled hands. A chemical peel causes old and damaged skin to peel off thereby making way for newer and younger skin to show off. Some chemical peels tighten the skin by stimulating new fresh collagen. Are sunspots and skin tightening on your list of things to work on this year? Then a laser treatment might be just what the doctor ordered. According to my nurse, “Laser treatments, which would be IPL, intense close light helps with that. We actually also earlobes as well. We treat a lot of people’s ear lobes. Not just their hands. It’s all about tightening and retraction because as we age our earlobes age as well. They get larger from earrings. So we work on both the hands and the ears with our laser. The Aerolase Laser is something to consider. Fillers are a popular treatment to manage wrinkled hands because they instantaneously plump up any section they are applied to. This makes complete sense, right? You put filler in your lips and you walk out of the office almost hiding your FACE. The results cannot be dismissed. Lauren says, “most people need about one to two syringes for their hands” to see any significant results and a “syringe could go anywhere from $675 to $800 per syringe”. I know what you are thinking – how long does this last?! I’m all about slowing down the hands of time, but $800 a syringe and if I need two a hand…. that’s a whole lotta math right there! The process usually lasts each client a year. Listen, if your hands are your pain point and you can’t stand to see the sight of them, then I say GO FOR IT. I know plenty of people that are constantly hiding their neck and their hands. If this could be a solution for them for under $4000 a year – worst case scenario, who am I to judge? I would NEVER! To each his own!! I am all for doing what you want and if this works, then honey, WERK IT! Your wrinkled hands are my rosacea… you know what I am saying!! If these high-priced solutions are not your cup of tea, you could always opt for over the counter solutions like hand creams that promise to plump and fill and are specifically designed for aging hands. This Retinol Anti-Aging Hand Cream is under $20 and a great place to start. Rafal Dermatology is a pretty busy establishment. I wanted to know, out of all the appointments that are booked, how many focused on wrinkled hands. Apparently, it is a very popular treatment. Dr.Rafal books between one to two treatments per day. So, what do you think? Is this something that you’d be interested in looking into? 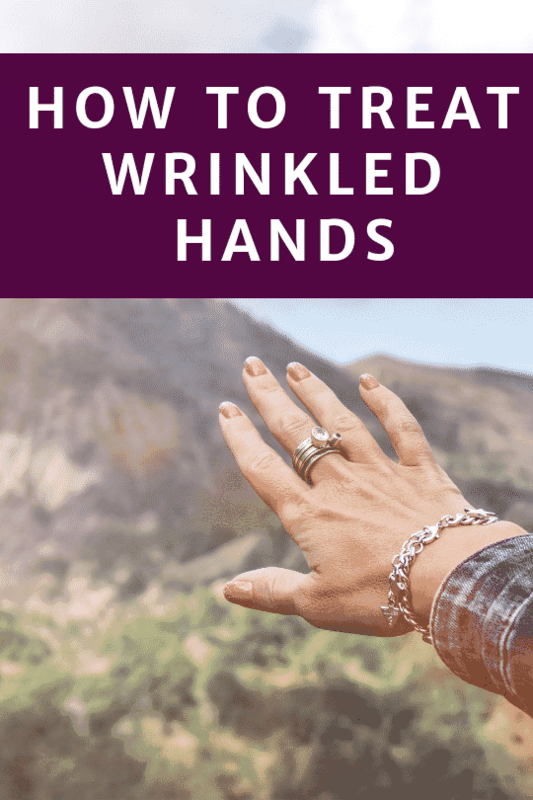 Are wrinkled hands a problem area you worry about? Or are wrinkled hands the least of your worries? I absolutely couldn’t do the fillers, but I’m down for hand creams. I’m honestly more worried about my neck – I’ve always had wrinkles on it, and am saving to have my neck tightened and double chin sculpted. I’ve also noticed my lips aren’t what I’d like them to be, so now I’m considering Volbella as well. But my poor hands will just have to settle for what hand creams, masks, and scrubs can do for them.